His Excellency Mr. 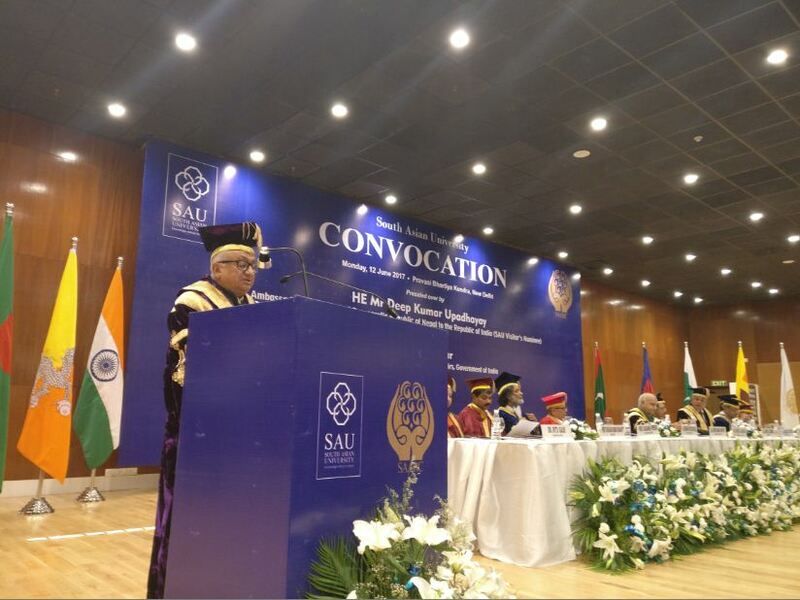 Deep Kumar Upadhyay addressed the 2nd Convocation Ceremony of the South Asian University (SAU) held in New Delhi today. Ambassador Upadhyay was invited to the ceremony as the SAU Visitor’s Nominee. Speaking to the gathering of the University’s faculties, students and invited guests, Ambassador Upadhyay stated that the South Asian University has been built upon the pedestal of the common South Asian heritage of wisdom and education nurtured in the region for the time immemorial. He also stated that the University served as a mark of shared aspiration for deeper regional cooperation and connectivity in South Asia. Mr Upadhaya congratulated the fresh graduates of the University for successfully completing the degree from the prestigious centre of academic excellence in South Asia. The years you spent here at this university, the years you exchanged and refined your ideas, the years you explored knowledge and widened your wisdom; these years must have been the best ones in your life, he said. The Ambassador called upon the graduating students to contribute to the process of South Asia’s development as well as to carry forth the message of peace, harmony and fraternity that have been the ethos of South Asia. Be it endowment of natural resources or it be the human resources, our region has abundance of enabling factors for development and prosperity, he said. Pointing out poverty and underdevelopment as a top common challenge faced in South Asia, Ambassador Upadhyay stated that the young graduates could be the vanguard in overcoming the region’s top challenges. The ceremony was also addressed by His Excellency Mr. MJ Akbar, Minister of State for External Affairs of the Government of India, His Excellency Amjad Hussain B. Sial, the Secretary General of SAARC, and other dignitaries. President of the University, Dr. Kavita made a presentation on various programmes undertaken by the University and its future plans. Ambassador Upadhyay conferred degrees to 185 students graduating in various faculties of the University this year including 16 Nepali students. South Asian University is a regional institution established as a part of the regional cooperation within SAARC.